Why is it called Immeasurable? “To do effective healing, beneficial healing it is suggested that we practice the Four Immeasurables. Four Immeasurables. Immeasurable of love, immeasurable of compassion, immeasurable of joy, immeasurable of equanimity. Then the healing becomes more powerful and meaningful.” — H.E. 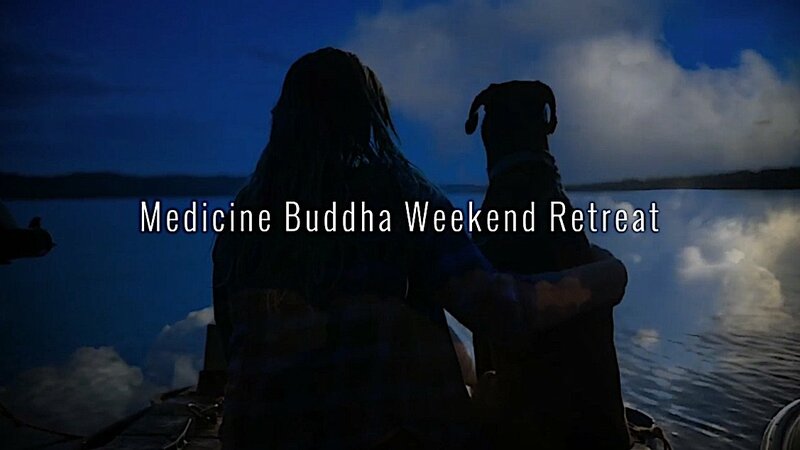 Zasep Rinpoche from Video 2 in a teaching series “Medicine Buddha Retreat Weekend. At this time we take refuge to Medicine Buddha as a healer and a Buddha. We take refuge in Medicine Buddha as a example. We walk on the footsteps of Medicine Buddha. The Medicine Buddha is actually same as a Shakyamuni Buddha. And you can say emanation of Shakyamuni Buddha. There are eight Medicine Buddhas; one of them is Shakyamuni Buddha. This afternoon, after lunch, I will translate for you a brief history of Medicine Buddha. The healing history, how it was taught, how it began and goes back at the time of Shakyamuni Buddha. Buddha Shakyamuni himself taught the Medicine Buddha Sutra and I will read and comment — translate for you — explain. I think this is very good. It is helpful. So we take refuge to Medicine Buddha as a teacher and healer and example. We also take refuge to Dharma, the teaching of Medicine Buddha the Sutra. We take refuge to Sutra, to the teaching and we take refuge to the healing method and we take refuge to the healing modalities. So that’s actually the real refuge and because we read Sutra and read the commentary of the Sutra and then study the method and healing modalities. Medicine Buddha Sutra was taught by the Buddha and then the Sutra was written down long, long, long time ago, and, back in India, originally written down on palm leaves. You cut out palm leaf and then dry them and then write them right? With the ink. And that’s how it started the scriptures a long time ago. And then Buddhism declined in India and then later on the Medicine Buddha Sutra is discovered and found by archeologists. Medicine Buddha Sutra was translated into Chinese language long time ago. More than thousand years ago. And, probably about 1400 years ago it was then translated into Tibetan, into Mongolian, or Russian, and Japanese and Korean and all the Asian countries. It is very popular in Korea and Japan, and China. So, this is how Medicine Buddha Sutra went around and became translated now in English and Italian and different European languages. We take refuge to the teaching of the Medicine Buddha practice. This weekend we are practicing Medicine Buddha Sutra teaching and healing method according Sutra. 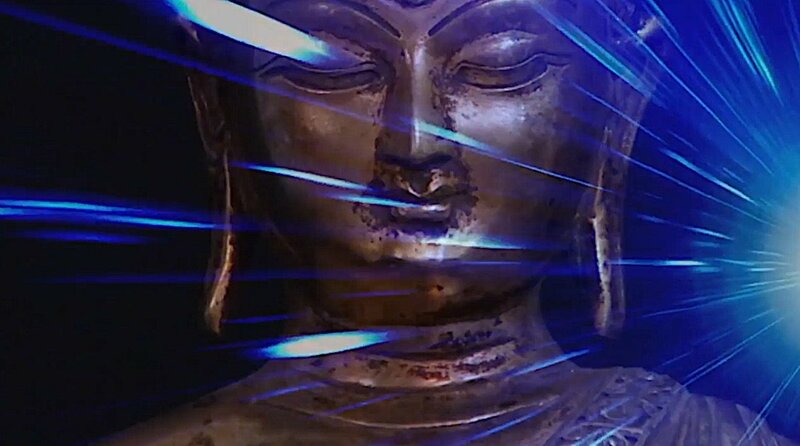 That’s the meaning of taking refuge to Dharma, Medicine Buddha Dharma. We take refuge to Sangha. We take refuge to the communities, spiritual communities. We sit together and talk and discuss and we do healing practice — send energy towards all beings and to each other. We take refuge to Sangha. Then we do the Four Immeasurables, okay. We go through this, we read [the written Sadhana, or meditation.] 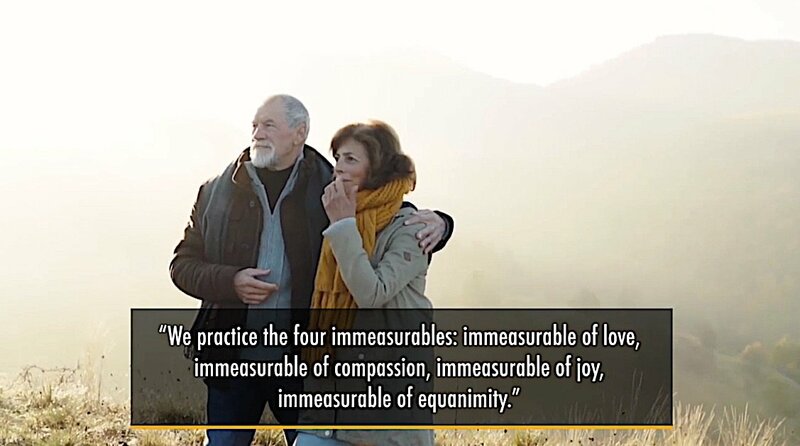 So, in order to do effective healing, beneficial healing, it is suggest that we should practice Four Immeasurables. Four Immeasurables. Immeasurable of love, immeasurable of compassion, immeasurable of joy, immeasurable of equanimity. Four: love, compassion, joy, equanimity, or equilibrium mind. Four. Then the healing becomes more powerful. 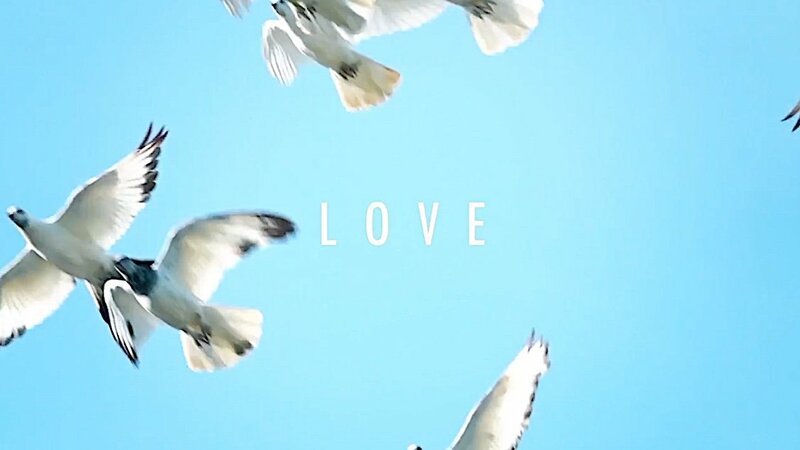 The first: love. Okay, love is universal, right? Love is the first ingredient and if you’re making herb or making tea, whatever, the first ingredient should be the love. With love, you make tea and tea will be better tea, okay? With love — loving heart — you make a herb and then the herb will be best herb. With love you cook meal, the best meal, okay. Whatever you do: artwork, painting, and sewing, whatever you do with love, then the art will be good art, right. Or whatever you do: driving car, whatever you do. So love is first, right? It’s universal, love. Love is first: motherly love, fatherly love, saintly love, and whatever, right? And everybody has love. We all have love deep in our heart. 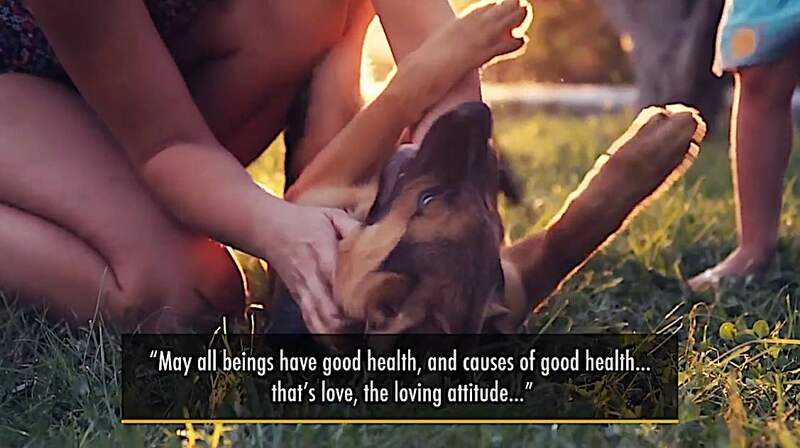 But not only us, but all human beings, animals, birds, insects — they have love. They love their offspring, love their babies, love their parents, love their community, right? The trees also love another tree. And, they have symbiotic relationship, they all support each other and grow together. And they die for the purpose of the future plants and you know, nourishing the soil. Because it’s all sort of love, right? And sounds little bit funny when I say trees love tree, you know. It sounds a little bit wishy-washy kind of thing and you might think it’s like flower children ideas, you know, and rainbow ideas and that kind of new-agey idea. But actually it is good idea, doesn’t matter whose idea is. Because it’s not wishy-washy, actually. It is how it is. There is love everywhere. We call it love without intention, without idea. It’s just natural love and unconditioned love — like the warmth that comes from the sun — it’s kind of like love, right. And we say in the Sutras, your love should be unconditioned, unintentioned, without thinking. Just natural acting, right, like the sun. The warmth is coming from the sun. Sun does not handle motivation or intention, it just naturally providing this beautiful light and warmness. Like the water has the same kind of quality. Even the space has the same kind of quality because how can we move around and do things without space? And fresh air. We need space and fresh air, so we go out, get some fresh air. We need space, that’s why we kind of move somewhere where there’s more space. Why so many people come to Canada now? Many people immigrating to Canada because they need space. Other places too crowded, too congested, and not healthy, that’s why everybody finally get to Canada, legally or illegally, whatever. And I came to Canada 1981 to join my sister, my family. Also I like Canada because same reason: space; lots of space. And mountain and British Columbia and birds, and so forth. Forest. Now I feel always very fortunate and so grateful to Canada. Our Canada, our land, new land, you know. So we need space. Space itself is very kind, you know. And this is what the Sutra say you should appreciate. First come with love — we call immeasurable love. Immeasurable love. Why it is called immeasurable? We also call limitless. Four Limitless or Four Immeasurables. So there’s different [reasons] we call it immeasurable. First, the attitude of love is immeasurable. It is actually the merit, the virtues. 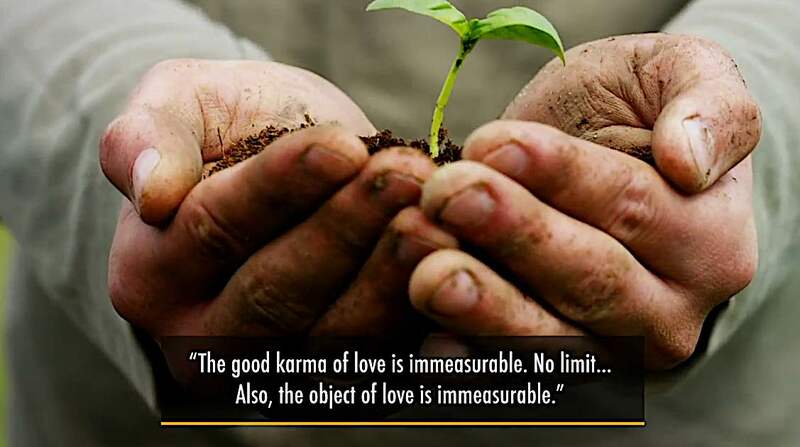 The virtues and the merit, or in other words, good karma of love is immeasurable. Has no measure, no limit. It’s huge. That’s why we call immeasurable. May all beings have health and cause of health. May all beings have good health and cause of good health. That’s love, loving attitude, right? 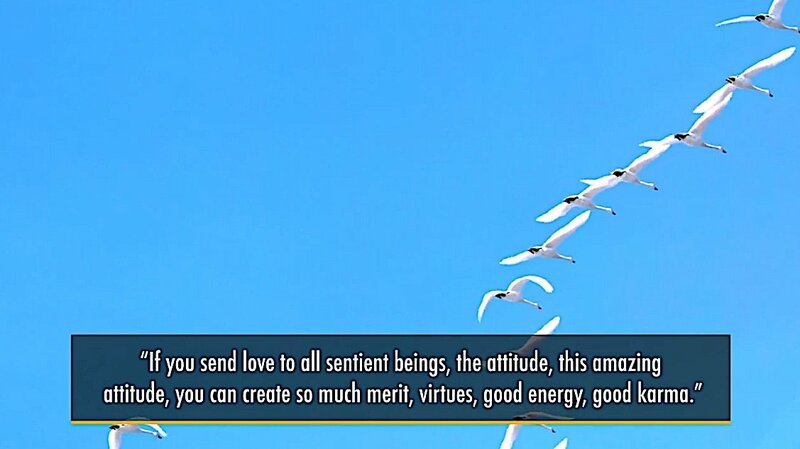 So you say the word “may all sentient being.” So that’s limitless. Sentient beings are limitless. Who are the sentient beings, right? Think about who are sentient beings. We’re not talking about only two-legged people like us. There are four-leggeds and some sentient beings have many legs, and some sentient beings are no legs, as worms and fish and so forth. Different kind sentient beings. What’s a sentient being? So insects, worms, and mosquitoes and even bacteria and parasites — all of them sentient beings. Like the worms. Worms move, right? You don’t see their eyes and ears and nose and so forth, but they move. They have feelings, they have sensitivity. They don’t want hurt, they want comfort, they want warmness, they want food. They’re worms, right? Worms are sentient being. So when you think about worms, insects, mosquitoes, — it is unthinkable how many. You lift up one big rock there be hundreds of ants, right? Your shoveling, gardening, and you see air and water everywhere. So many. This is why we call limitless. It’s no limit. 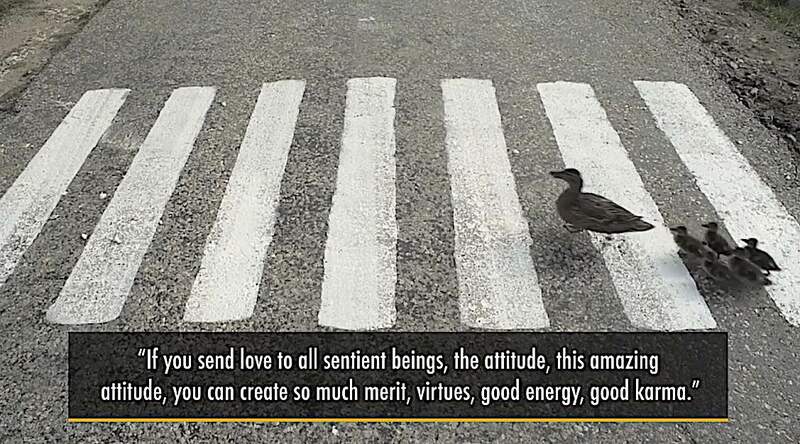 So imagine, if you cultivate love towards all sentient beings, even if you are just sitting on a cushion not doing anything, and you send love to all sentient beings — this attitude, this amazing attitude — you can create so much merit, so much virtues, and good energy, good karma. And because its energy first, right. Motivation first. Without motivation there’s no action. First we have to motivate, good motivation, strong motivation. Motivation is the drive, the force. Then you get up, jump, and run, do things, right. You have strong motivation. So, first one is limitless of love. Object is limitless, merit is limitless. The second Immeasurable is Compassion for all sentient beings. Likewise, next one. Next immeasurable is compassion. May all beings be free of illness, sickness, causes of sickness. All of them in the world, may all beings free of suffering and cause of suffering. So the attitude of compassion is about illness, pain, suffering of others. You first think, first idea, first thought, interest in your mind, occurred in your mind that, okay, I see suffering. I see myself in pain and so forth. I see other people suffering. There so many sentient beings suffer. I wish to eliminate the suffering of all sentient beings. And I wish to eliminate cause of suffering and pain of all sentient beings. Whatever I can, right. I know I can’t fix everybody’s problems, but the thought is important. The thought that counts. Okay. Is that true? No, I don’t think so. I don’t know, how could one drop water make ocean bigger? Almost impossible, right? But still water, still water right? You drop one drop, two drop, three drop, and it does have effects. If you imagine, look at side of the mountain. You go to Tibet or Himalayas, certain areas, water coming down. Small trickle coming down, water dropping, one drop, two drop, constant, constant, consistent. Drop, just one drop water. Day and day and night, day and day and night, all the time. You see around this area, maybe five feet, two feet, it’s all green. There’s a different kind of vegetation. Unique ecosystem. Unique because the little bit of water, little bit of moisture, and makes it little bit green. And flowers shows up by itself. And butterflies or insects come. It’s got unique ecosystem created by one drop water just coming down. Consistent water coming down, eventually it moves, it carves the rock. The rock becomes smooth. You go down to Arizona or some area, you know, the rocks are very carved like this by the water. Water is soft. Rock is hard. But the soft thing can carve the hard one, if it’s consistent. If you have the energy, if you have the motivation, if you have perseverance. Constant, constant. So we should not think it’s not worth it, meditate or compassion. “I can’t do much, you know, I’m tired and I’m too busy,” and you know, you can say things like that, right. But everybody can do something, little bit. And even attitude is important one because we are sending this thought, good thought to the universe and others can pick up this thought from us. Like 100 monkey minds. One monkey doing something in Africa, the other monkey’s in Brazil or Amazon forest picking up, doing the same thing. Picking up the fruit or crushing it, doing the same thing. They get the same idea through somehow. Consciousness connected, right. So think like that. See, and if we’re sitting here meditating and then some other people, group of people in Poland or Ukraine or somewhere doing the same thing. I’m sure lots of places this weekend doing Medicine Buddha healing practice. Same time because Medicine Buddha is a popular one. In China or Taiwan or Mongolia or somewhere in Africa that people do the Medicine Buddha practice. So you see Buddhist centers everywhere. Now Buddhism is growing in Eastern Europe like Poland and Russia and so forth. And so, because we all connected, right. So merit of compassion, limitless of compassion. And then the third healing practice is joy. So compassion and joy. Compassion is universal spiritual practice. Essence of all the spiritual practice. 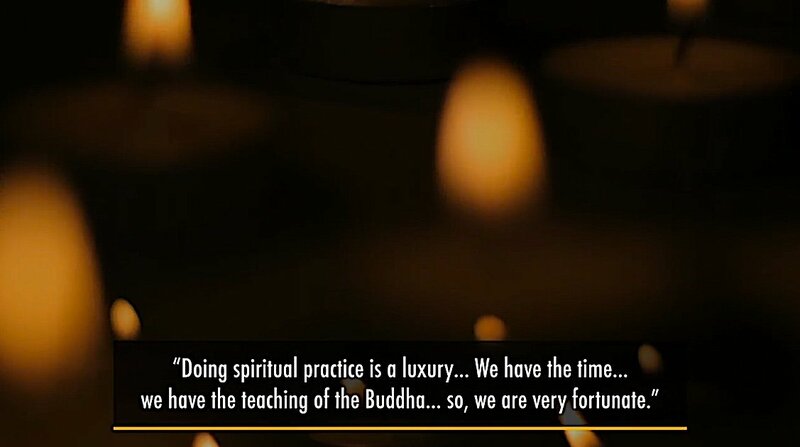 Essence of Buddha’s teaching. Essence of teachings of Jesus. Essence of teaching all the Hinduism and so on. Essence of compassion, same essence. And this is the second practice or limitless practice. And third one is joy, okay. So now, limitless joy. So when we do spiritual practice and meditation it generates joy. Joy is, I believe personally, joy is important. To generate joy. Joy is the opposite of sorrow, sadness, right. You have joy and sadness. So we don’t want to be sad all the time. We don’t even want sadness. We want happiness, we want joy. So in order to have good health and to do healing practice, we have to have joy inside. And we have to be joyful. Joyful. And in order to heal somebody else, give healing blessing, we have to have joy. Spiritual people should be more joyful. Shouldn’t be sad. I shouldn’t walk around with guilt and fear. And spiritual person or religious person should not walk around with so much guilt and fear and so forth. Then how can you help if you have so much guilt yourself and you have sadness? You can see the face, right? So you say, “How can he help me, he’s even he himself is sad?” I can’t be sitting next to this fellow and I feel more sad. We all sitting together, crying. Or feel guilty or whatever, right. And so you have to sit with joyful person and you have to be joyful. But it’s not easy to be joyful, right. Because the world situation, you see. Some people feel guilty being joyful: “Everybody suffering, I can’t be joyful here. I can’t be happy. I don’t want to be happy. I want to be martyr and I want to do something, you know. Hurt myself, hurt others. Or I mean, hurt myself to in order to help others.” Whatever. And you should be hurt yourself in order to do something good for others. And everybody’s become kind of martyrs, right. And so that’s not the Buddhist way. The Buddhist way is peaceful, joyful, liberation. And joyful living, joyful action, joyfully. So here we call here joy. So not easy to be joyful, right. So how do we make it our self? The question is how do we make our self feel joyful? And how we make others joyful? So first we have to recognize is there is good reason, good reason or logic why we should be joyful. Or, you know, in other word: thankful, grateful. And gratitude for others, right. In Buddhism we say, “We have obtained precious human rebirth.” Okay, we’re human being, we got human precious human rebirth, because everybody’s life precious, right. And animals and so forth. But we have more opportunity than others. We have language, we have psychology, we have philosophy, we have tools, and we have opportunity to practice each one. And there are seven billion people on this earth. I’m not sure the numbers, but that’s what I hear. Seven billion, that’s a lot of people, right. And you think about how many people have spiritual practice, do spiritual practice. How many people have chance to do spiritual practice? Many people don’t have spiritual practice, no chance. They like slaves, they’re just barely surviving, right. And trying to find food. Trying to find breakfast. Trying to find dinner. Trying to find lunch. They find breakfast, no lunch. Find lunch, no dinner. Some people eat only about one meal a day because you have to share this little piece of bread with your children, family, right? It’s how it live in the village somewhere, far away. Or in the slums, you know. No time for spiritual practice. First you have to fill your belly, fill up your belly. No time. We’re not saying so hard to obtain human life or human birth. Like long, long time ago back in Tibet, when Lama was sitting on throne, he’s giving discourse. He’s saying very hard to obtain precious human rebirth. And one man he got up and said, “Lama, you never been to China. You go to China you’ll find it’s not so hard to find a precious human body. You should go to China, you haven’t been to China.” Because this Tibetan guy went to China, so many people. That was long time ago, maybe hundred years ago. Now you go to China or India, you know, or Brazil, so many people, so crowded, right. So if that makes you to think of precious human rebirth, not so precious. Well, it’s all numbers and proportion, right? But we’re not talking about just human rebirth, we’re talking about opportunity for Dharma practice and spiritual practice. If you have that, then there’s good reason to be joyful or thankful, right. Appreciate. And then be joyful and then go to our mothers, fathers, grandparents, and children, partners, neighbors, everybody. Very grateful because we’re all supporting each other, right. We’re all interdependent, interconnected. And we live in this beautiful country. So thankful and then you feel bit a little more joyful. And now we generate this joy and share in the joy with others. This is one of the third Immeasurable. Fourth one is equanimity, or equilibrium mind. So may all beings abide in equanimity, free from attachment, anger. Holding some [beings] close and others are distant. So there’s a beautiful meditation here for equanimity or equilibrium. You sit here and you visualize people around you. And on the right side you can visualize all the males: your brothers, or your husbands, your friends, colleagues, grandfathers, and so forth. On the left side are your mothers, sisters, your wife and daughters, so on and so forth. All these females. Then in front of you, you visualize people that you have hard time. You have a hard time with some people, they give you a hard time, you know. And you have some problems, issues. So visualize those people right in front of you, right here. And then visualize some people that they’re not your mothers and fathers, but other people that you love. You visualize behind you, the loved ones, including dogs or cats, your animals that you love, pets. 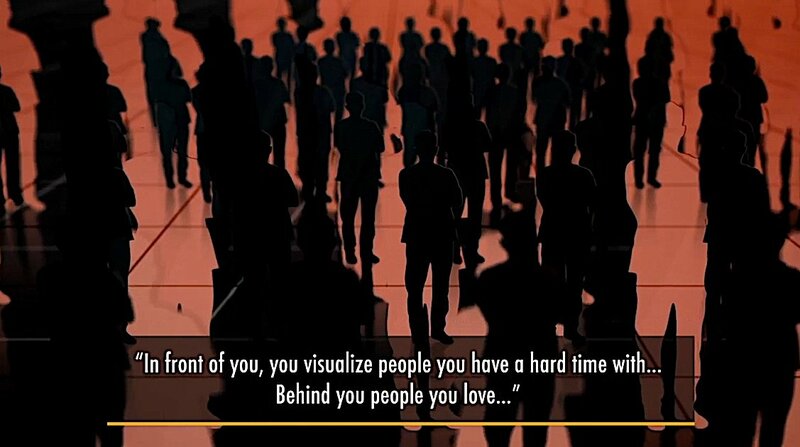 So you visualize behind you. So all everybody’s here now, okay. Everybody’s here. So then you develop this attitude we call equilibrium mind. I would like to send my love to everybody. 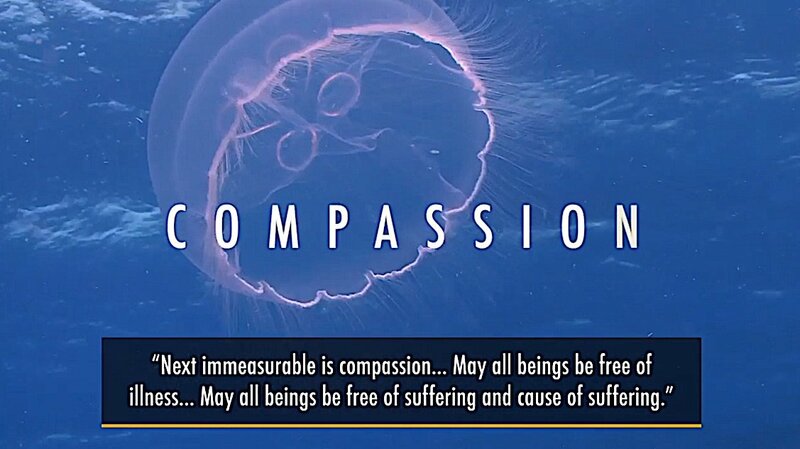 I would like to send compassion to all, everyone. I would like to send joy, I’d like to share joy with everybody. I would like see everybody is happy, no more suffering. Even. Equal. I don’t feel closer to some or distant to others. No discrimination. And equilibrium mind. And pronunciation is difficult even after speaking, learning English so many years, still little bit difficult in pronunciation. Different language. So you want to have a good farm, but to have a good farm you have to have good soil, good surface, right. So you have machine, tractors, bring good soil. Spread it equal, even, right? And then you spread the seed. That’s same idea. 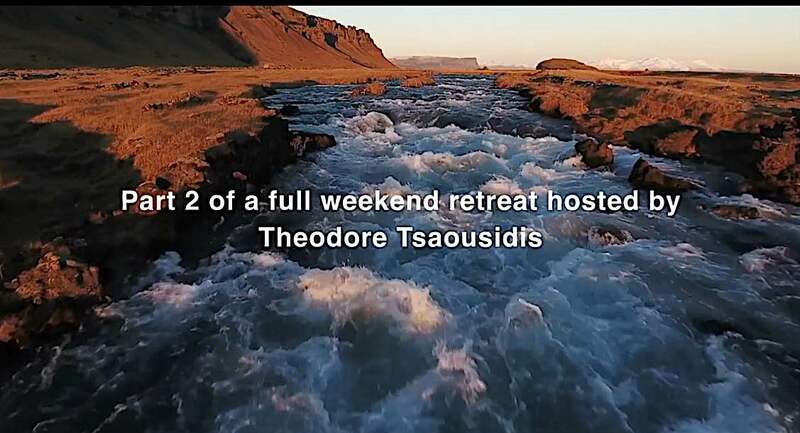 Meditate on the Four Immeasurables Video teaching part 2 of a Medicine Buddha Weekend Retreat with H.E. Zasep Rinpoche. We call merit field. In Tibetan word, in Buddhist term, we call merit field. So you want to create merit or virtue you have to field, right. So good field, soil. Like that, in order to create merit of compassion, love, joy for all sentient being first you have to meditate equanimity. If I feel close to somebody, distant or not, how can I merit love for all sentient being? My compassion or love is not impartial. So that’s why we meditate on equanimity. Equilibrium mind. So we do short meditation here on equilibrium mind, equanimity. So imagine you’re sitting here, imagine all these sentient beings around you. In front of you, behind you, right and left. Your fathers and brothers and so on. Mothers and sisters on the left. Fathers and brothers on the right side. And people that you have difficulties, issues, so forth, they are in front of you. And all that you are scared of, like snakes or tigers and bears, whatever, all of them in front of you. And then on the back side behind you is like, sentient beings who are very sweet and nice and your dog or cat and your friends and like other sentient beings they’re very cuddly, very passionate. And there thoughts of all these sentient beings behind you. Now imagine they’re all the same because they’re all living beings. They all want happiness. 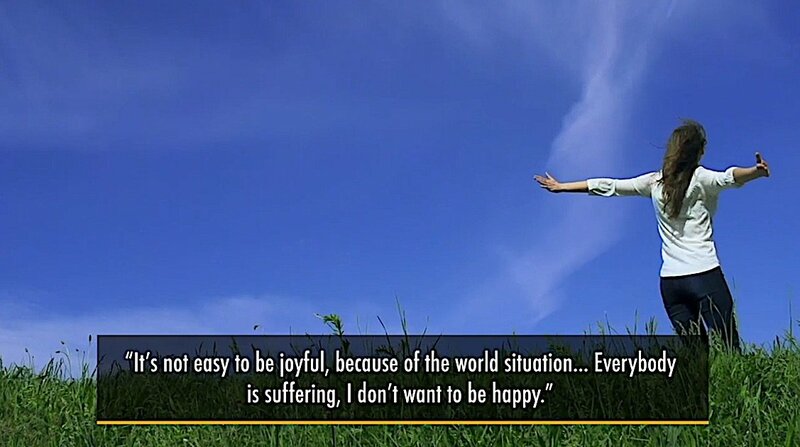 Nobody wants suffering. Everybody have opportunity to become enlightened. Therefore, I would like to share my meditation of love, and compassion, and healing. Specifically healing. At this time we’re doing healing practice, Medicine Buddha healing practice. So, I like to practice healing. I send my healing energy to all of them equally. 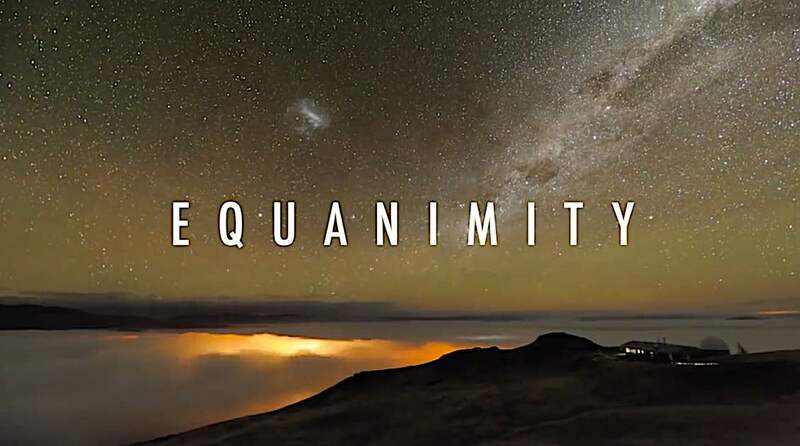 And I have to feel equanimity in my heart in order to do effective meditation, healing meditation, and do healing practice. 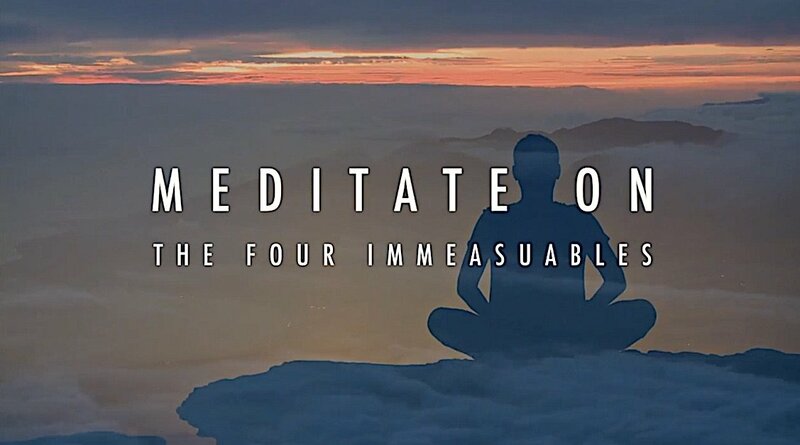 Followed by a visualized meditation on the Four Immeasurables. Broken Commitments: 3 Teachers weigh in on practice “overload” and breaking Vajrayana practice promises. What do we do about it?